Our innovative range of Steel Kitchen Sink Mini Bowl in different basic forms from single bowl kitchen sinks to stainless steel double bowl sinks to sinks without drain boards. These double bowl sinks have a beautiful brushed satin finish and sound deadening insulation. 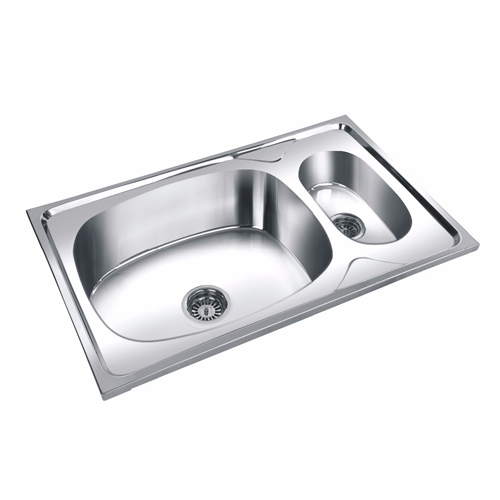 We can offer the wide range of double bowl kitchen sinks made of high-quality stainless steel. Our kitchen sinks are available in different design and dimensional specifications based on the requirements of the clients. The establishment in the year 2012, We, Bluestar Sanitary Industries Private Limited are the manufacturing, exporting of the Infusing the statement of style to the contemporary interiors, Anupam International presents the Luxe Line of the sophisticated kitchen and sanitary ware. We manufacture and export an exclusive range of quality products including Stainless Steel kitchenware's, Stainless Steel Sanitary Wares, Stainless Steel Sink, Lavatory Pan, Pedestal SS Wash Basin, PVC Cistern, Single Flush Cistern, Toilet Seat and more. We have been in the business for more than eight years, creating modern as well as timeless designs that provide years of functional use. A dedicated effort towards quality and design excellence has consistently fueled our growth in the competitive international market. We have a well equipped manufacturing unit that can efficiently all the requirements of the clients with precision. Our team of highly qualified and experienced professionals works in close coordination with our clients to provide innovative design solutions as per their specific requirements. Our R & D department has kept distinctively ahead in the competitive market by selecting best material and special geometry for every product. We are committed to providing the best quality of products that suits every interior. Further, we are committed to achieving the highest level of customer satisfaction by providing prompt services and delivery of consignments to any corner of the world.